Nothing illustrates the concept of the fine line like a kaftan. Is it the must have cover-up for holidays in the Pacific Ocean, or is it the sad refuge of the bubbly, overweight party hostess? I think the secret lies in how much you pay for it. 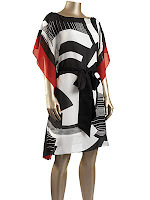 At £735, nothing says chic holiday like Missoni. Alternatively, swimwear guru Melissa Odabash will make you beach fabulous for £370. At the other end of the spectrum, we have the Venetian at Kaftan World to give you that ‘misjudged party ensemble’ look. But hey, it will only set you back £19.95. And I imagine it must be great for chilling out at home with a book and a glass of lemonade. Just don’t let the ladies on the homepage put you off. I bought a kaftan for the first time this year, and I went for the middle option – a silk one from Monsoon, also in the £19 range, but only in the summer sale. Originally the dress went for £65, thus giving it some fashion cred. And because I’m not actually going somewhere in the Caribbean or the Pacific Ocean, its main function at the moment is to elevate my evenings-at-home look, when I wear it my Rick Owens dustulator cardigan (a sale purchase from a few years ago) and a pair of Havaianas. Another guideline is authenticity. As in, you don’t want it. Batik makes everyone look like an art teacher. Everyone. Approach authentic shapes and patterns with extreme caution. I love love love the kaftans by Melissa Odabash! So classy and beautiful. Great finds!